Great to use and part of an ever expanding system, the Nikon V3 is the company's best CSC yet. The Nikon V range of compact system cameras was generally intended to be aimed at those looking for something a little more serious. The last incarnation of the V range, the Nikon V2, was almost DSLR like in its styling, in that it had a good range of dials and buttons as well as an integrated viewfinder. For the V3, Nikon has taken a slightly different approach, removing the viewfinder and giving the overall body design a more stylish, revamp. It still has manual control, and if you want a viewfinder you can add one via the accessories port, while the decent number of buttons and dials stays with the added advantage of a new, tilting touchscreen. As with all other Nikon 1 cameras, the V3 has a one-inch type sensor. This is smaller than most other compact system cameras, which generally feature a Micro Four Thirds or APS-C sized sensor. This however, does allow the overall size of the 1 system to be very small. The V3's sensor has 18.4 million pixels, an upgrade from the V2's 14.2 million. Interestingly, the sensor's optical low pass filter has been removed, which should mean an increase in detail resolution – it will be good to compare the V3 with the V2 in our lab to see if this is borne out in reality. It will also be interesting to see how well it compares with cameras that feature a larger sensor. The V3 also now has an Expeed 4A processor, an upgrade from the 3A which was found in the V2. This should facilitate improved low-light shooting, and to reflect this, the V3's maximum sensitivity has been increased from ISO 6400 to ISO 12800. We are curious to see how shooting in low light at such high sensitivities will fare during our test. Nikon's hybrid autofocusing system makes a return for the V3, with an increase in the number of autofocusing points – there are now 171 available (135 previously). Of these points, 105 are phase-detection points, for quick focusing. The remaining are contrast detection, which are used for accuracy. Unsurprisingly, Nikon has kept some of the unique functions about the Nikon 1 series, including Best Moment Capture, which now features a new Active Selection Function that takes up to 40 full resolution images in less than a second and lets you choose the one to keep. Along with manual control, there are semi-automatic and fully automatic modes to choose from. There's also a new Creative Palette mode that allows you to select different effects to be applied to an image before you shoot. There's a good range of lenses available for the Nikon 1 system, and it seems that Nikon is investing fairly heavily in developing the system. At the time of the V3 launch, Nikon also introduced a 70-300mm lens. The V3 comes as standard with a new retractable "power zoom" kit lens. Nikon's 1 range of cameras have a 2.7x crop factor, meaning that the 10-30mm f/3.5-5.6 kit lens offers an equivalent of roughly 27-80mm in 35mm terms. The lens automatically retracts when not in use to keep the overall size of the camera down for transportation. You can also attach existing Nikon F mount lenses via an adapter if you wish – which could make this an appealing prospect as a second camera for Nikon DSLR owners. In terms of competition, the V3 is a little bit difficult to place. 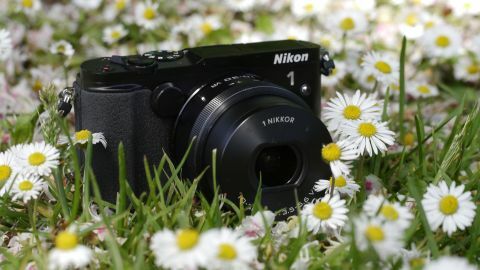 It sits at the top of Nikon's CSC line-up, but the smaller sensor and price puts it closer to some manufacturers middle tier. In terms of other cameras with a one-inch sensor, it goes against the Panasonic GM1 and the Samsung NX Mini.